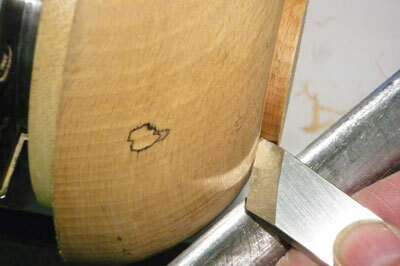 Cutting a clean spigot which is the correct shape for fitting into a chuck is very important. Not only to cause the project to be held securely, but also to run true, reduce vibration and minimise the jaws marking the workpiece, which is especially important if you are not going to remove the spigot after completion. We have a choice of tools to use - a skew chisel or a spindle gouge. 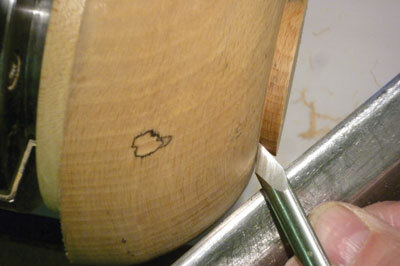 The spindle gouge is safe to use to cut the spigot as the tool is very close to the toolrest. It is important to have a clean corner at the base of the spigot so the jaws will sit flush. Take as many cuts as necessary to cut the spigot. 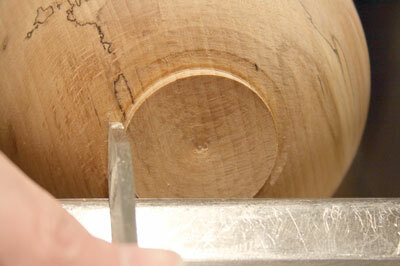 With the spindle gouge now at the bottom of the spigot, you will have a very clean cut. Rubbing the bevel on the base start a small cut right into the corner; this needs to be flat to allow the jaws to sit flush and tight into the corner. Now light sand only for your completed spigot. Having a clean cut spigot allows your item to run true and will cut down on vibration. Start by sizing the spigot to the correct diameter for the jaws of the chuck you are using. This is important so the jaws enclose the spigot fully and securely. If it is too small, the jaws will only grip in the centre of each jaw; too large and the corner of each jaw will leave marks on the spigot. The skew chisel I prefer to use is a flat side skew chisel; this will lay flat on the toolrest whereas an oval skew chisel can dig in if not presented correctly. Place the toolrest close to the work. Use the long point of the skew chisel and angle the tool to achieve the correct angle on the spigot, which will also match the dovetail on the jaws. Start to advance the skew sideways. Now you have reached the base of the spigot, it is important that the corner is clean, and no waste left so the jaws fit into the corner; any waste and your item will not seat correctly in the jaws. This will now require sanding. The spindle gouge is my preferred tool for cutting a spigot as this will give the cleanest cut with little or no sanding. Keeping the toolrest close to the work will help with tool control. 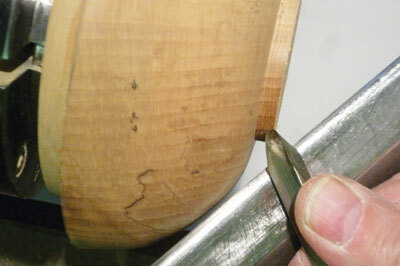 Place the spindle gouge on the toolrest - on its side with the bevel just rubbing on the spigot - and advance the gouge down the spigot at the corresponding angle of the jaws of the chuck with the bevel rubbing all the way down. Philip started turning professionally in 1986. He is a member of the AWGB and runs courses from his workshop.